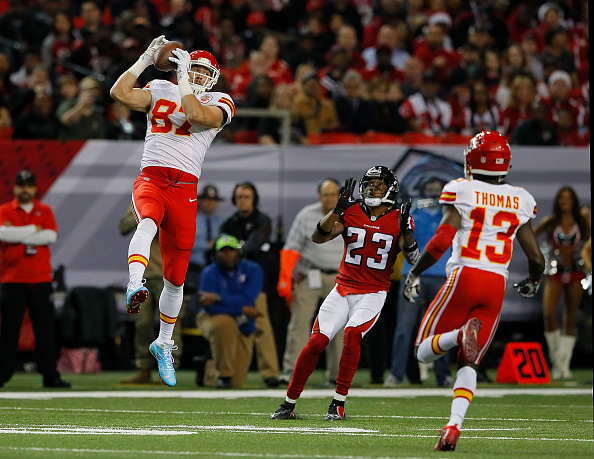 Eric Berry returned an interception for a touchdown, and then brought back another pick for a 2-point conversion that gave the Chiefs an improbable 29-28 victory over the Falcons on Sunday. The Falcons, rallying from a 27-16 deficit, went ahead 28-27 on Matt Ryan’s 5-yard touchdown pass to Aldrick Robinson with 4:32 remaining. Atlanta decided to go for 2, looking to stretch the margin to a field goal. But Berry stepped in front of Ryan’s pass and ran 99 yards the other way to give the Chiefs (9-3) their winning margin. It came after Denver stole a game in similar fashion last month, returning a blocked PAT for the winning points at New Orleans. Sunday’s outcome meant even more to Berry, who grew up in suburban Atlanta and was playing in the city for the first time as a professional. Also, it’s where he was treated after being diagnosed with Hodgkin’s lymphoma near the end of the 2014 season.